Taekwon-Do is a Korean martial art and the national sport of South Korea. In Korean, Tae means "to strike or break with the foot"; Kwon means "to strike or break with the fist"; and Do means "way," "method," or "art." Thus, Taekwon-Do may be loosely translated as "the way of the foot and fist" or "the way of kicking and punching”. Taekwon-Do is the world's most popular martial art in terms of the number of practitioners. Its popularity has resulted in the varied development of the martial art into several domains, as with many other arts, it combines combat techniques, self-defence, sport, exercise, meditation, and philosophy. Taekwon-Do is also used by the South Korean military as part of its training. Gyeorugi, a type of sparring, has been an Olympic event since 2000. In 1946, When Choi Hong Hi (the founder) was a second Lieutenant in the Korean army, he became ashamed of teaching his solider's Karate which is a Japanese martial art. It was at this time that he developed his first technique, a Low Block. Taekwon-Do was unwittingly used by Korean soldiers during the Cold War and it was not until April 11th 1955 that Taekwon-Do as we know it, was inaugurated By General Choi Hong Hi. Formally, there are two main styles of Taekwon-Do. One comes from the Kukkiwon, the source of the sparring system sihap gyeorugi which is now an event at the summer Olympic Games and which is governed by the World Taekwon-Do Federation (WTF). The other comes from the International Taekwon-Do Federation (ITF) which is the self-defence element. Separate from the various Taekwon-Do organisations, there have been two general branches of Taekwon-Do development: traditional and sport. The term "traditional Taekwon-Do" (Ch'ang-Hon style ITF) typically refers to the martial art as it was established in the 1950's and 1960's in the South Korean military forces, in particular, the names and symbolism of the traditional patterns often refer to elements of Korean history. 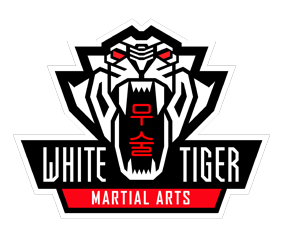 The ITF style of Taekwon-Do was changed in the 80’s to incorporate Sine Wave movements which diminished the use of a hip twist which White Tiger still use to this day. It is this style, the Ch'ang-Hon style (traditional style) that White Tiger practice. Sport Taekwon-Do (WTF) has evolved in the decades since then and has a somewhat different focus, especially in terms of its emphasis on speed and competition (as in Olympic sparring), whereas traditional Taekwon-Do tends to emphasise power and self-defence. The two are not mutually exclusive, and the distinctions between them are often blurred. Although there are doctrinal and technical differences between the two main styles and among the various organisations, the art in general emphasises kicks thrown from a mobile stance, employing the leg's greater reach and power (compared to the arm). The greatest difference between various styles, or at least the most obvious, is generally accepted to be the differing styles and rules of sport and competition. Taekwon-Do training generally includes a system of blocks, kicks, punches, and open-handed strikes and may also include various take-downs or sweeps, throws, and joint locks. Some Taekwon-Do instructors also incorporate the use of pressure points, known as jiapsul, as well as grabbing self-defence techniques borrowed from other martial arts, such as hapkido and judo. Ch'ang-Hon Taekwon-Do was brought to Britain in 1967 by Master Rhee Ki Ha and the popularity of the art has exploded. For men, Women & Children from 7 years of age.